Launching a non-profit online marketing campaign to engage donors around the Carolinas. 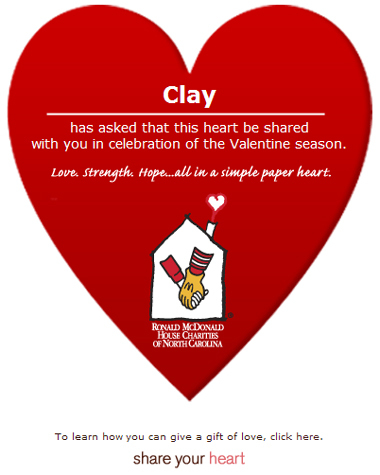 Ronald McDonald House Charities of North Carolina has run a Valentine's themed campaign for the past couple years known as "Share Your Heart." It has been a point of purchase campaign where shoppers at selected stores can donate a dollar after making a purchase and then give a paper heart to someone close to them. This year, their PR Firm, McKeeman Communications and marketing firm, Grace Strategic Marketing, thought it would be great to add an online element to extend the reach of the campaign to those who may not see the point of purchase promotion. The team came to us, knowing that we act as a web development partner for PR firms and have launched dozens of non-profit website designs to implement the design and set up the design for the new rmhcnc.org as a portal to this campaign. We also had the idea to let people send virtual hearts to friends from the site, in order to establish it as more of a destination and to refer other people to the campaign. The team loved the virtual heart idea, and we were off to the races. After coding their design, we designed the Virtual Heart feature, which allows visitors to personalize a heart (seen above) and send to up to 10 of their friends. The friends get an email that refers them to both the heart and the main site. This site is a great example of how to take current campaign, move it to the web, and add an online touch that encourages usage. By building in the Share a Heart online feature, the campaign automatically gains legs and expands its network of visitors/donors far beyond the original visitors. Please join the movement and visit the site to share a heart this Valentine's season.